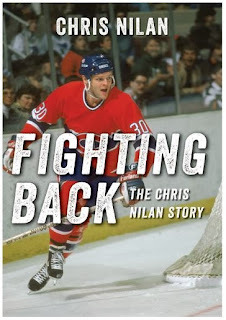 With the help of writer Don Yeager, Chris Nilan has released his autobiography, Fighting Back: The Chris Nilan Story . Has there ever been a more aptly named book? The former Montreal Canadiens tough guy is the fifth most penalized player in the violent history of the National Hockey League. In one game he managed to accumulate a NHL record 10 penalties in one game! Nicknamed "Knuckles," Chris Nilan was one of the most feared fighters ever. But as we have come to find out in later years, the biggest fight of Nilan's life has not been against Jay Miller or Dave Brown or Bob Probert. No, it has been Nilan's fight to stay away from drugs and alcohol. Nilan reveals his off-ice battles with an addiction to pain killers developed into a life-and-death struggle with booze, heroin and depression. He is open about his downfall because he hopes no one else has to go through it. Like recent books by Theo Fleury and Bob Probert, there is some pretty heavy content here. It may be uncomfortable at times but it is expertly presented by the authors. A good book gets the reader emotionally involved, and this book accomplishes that. Of course it helps that the main character was once one of the most famous/infamous and loved/hated hockey characters of his time. The attachment is already there for most of us. And there is always a soft spot for these kids who fight against long odds to make it big. Nilan grew up on the tough streets of Boston and became one of the most feared enforcers in the history of hockey - no easy feat. He also served as a pretty decent role player, helping the Habs win the Stanley Cup in 1986. He scored 20 goals that year, often playing on a checking line with Guy Carbonneau and Mike McPhee. 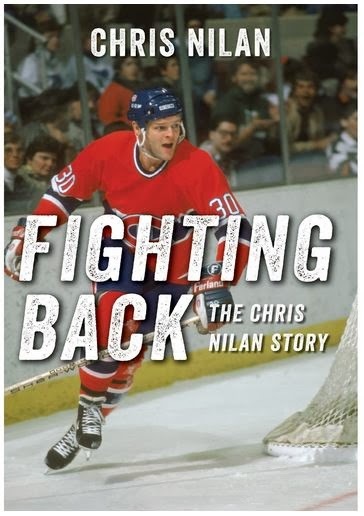 Ultimately Chris Nilan's story is a story of triumph. He constantly has overcome obstacles, whether the fight be to make it to the NHL or, thankfully, his fight against his demons. And now that he has his life back on track, he wants to help others who face similar demons.